Note to self: if coworker ever offers some of her pig products again, be sure to take her up on the offer! I am a lucky duck! One of my coworkers has chickens, pigs, and lamb on her property, and she had some left over cuts of meat that she was trying to get rid of. She asked if I would like to take some smoked ham hocks off her hands. Hello?! Um, YES! I used the ham hocks together with some heirloom dried beans from Crescent Moon Farms to make amazing ham and beans. I am not sure if I have ever made anything tastier! My hubby and I ate this for dinner, and there was enough to have some for left overs for a few days. And bonus, I still have two pieces of ham hock in the freezer, so I can make this again! 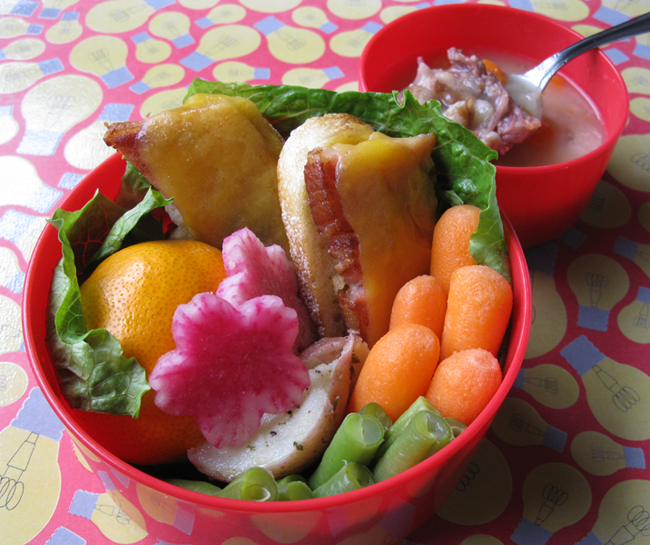 In this bento: ham and cheese sandwiches on baguette slices, a mandarin orange, watermelon radish 'flowers' from Wild Rose Ranch, boiled new potatoes, carrots, and steamed green beans. In the background is the small container with the ham hocks n' beans. Closeup of the delicious ham hocks n' beans. The beans kept their beautiful speckled markings. 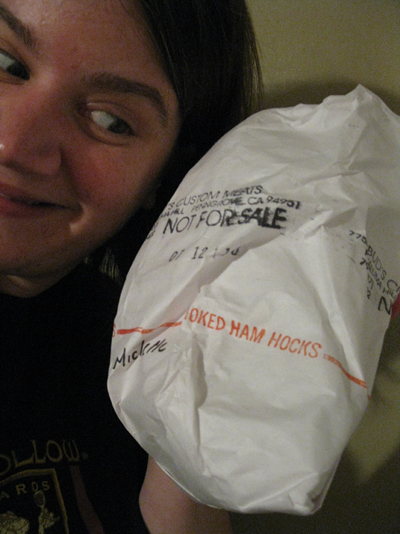 Happy me with my frozen smoked ham hocks! 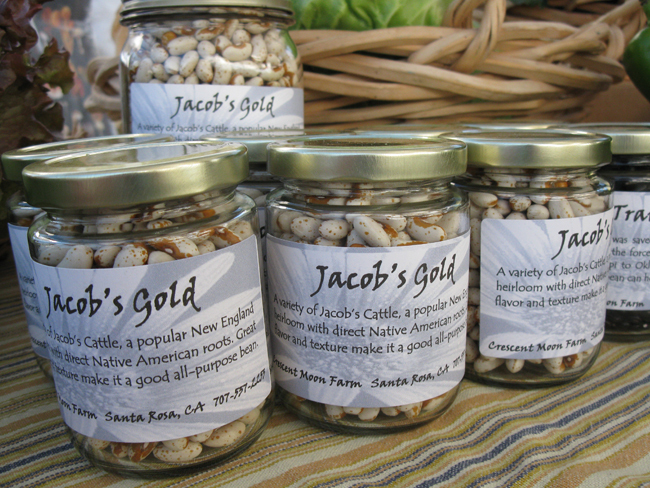 If you see jars of these beans (or other dried varieties) at Crescent Moon Farms at the Santa Rosa Farmers Market, be SURE to snap some up! Pick over beans to make sure there are no pebbles or other debris in them. Place beans in a pot and cover with cold water by 2 inches. Put pot over high heat and bring to a boil. Boil beans for two minutes, then cover pot and remove from heat. Allow beans to soak for 1 hour. Pour off soaking liquid. 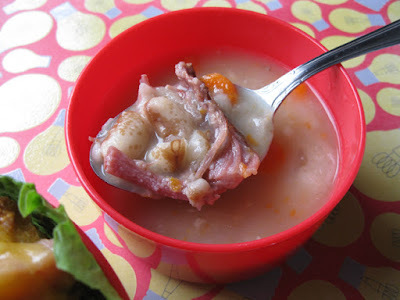 Add thawed ham hock, onion, carrots, garlic, and bay leaves. Add water to pan to nearly cover ham hock. Bring water to a boil, then reduce to low heat and simmer for 1 hour. Check beans to see if they are done. Carefully pick meat from ham hock and add to beans, discard leftover ham hock bone and grisle. Serves 4 to 6. LEFT-OVER cuts of meat? How the heck does someone have a left-over cut of meat? I mean, no matter how big it is, I'd just keep cooking and eating and cooking and eating until it was GONE. You ARE a lucky duck! Ha ha, dragonmamma! They raise their own pig each year, and this package of ham hocks had to make way for the new pig.